PA0RDT compact active wide-band receiving antenna for lower frequency bands from 10 kHz to approximately 10MHz. The active antenna designed by PA0RDT may offer a practical technique for exploring radio frequencies below 500kHz and is reported to offer good performance in the lower frequency bands from 10kHz to at least 10MHz. Slightly modified from the original design to take advantage of available components this active antenna is intended to trial this type of receiving system. The MPF102 has similar characteristics to the J310 transistor with the advantage of the later being low noise however with general higher noise levels of the lower frequencies this should not be a problem. Fig 1 The compact active wide-band receiving antenna unit schematic. Fig 2 List of components. The circuit is assembled on single sided PCB with the copper clad board separated down the middle. The left side forms the antenna and the right side is ground and has a section of Vero-board glued to the back for component connections. The final board is mounted in a section of PVC water pipe for weather protection. The board is connected via a very short section of coax to a male N type connector that is fixed to the base of the water pipe bottom end cap. Constructing antennas around the male N type connector allows for mounting on the standard station Generic Antenna Mount. 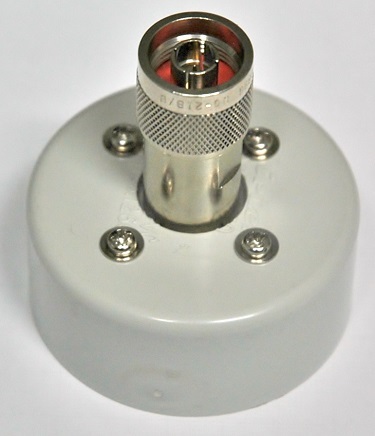 The active antenna is powered with approximately 12 ~ 15V via the connecting coax cable with the masthead coaxial cable power feed unit. Fig 3 The compact active wide-band receiving antenna board dimensions viewed from the back. Photo 1 The compact active wide-band receiving antenna circuit board assembled viewed from the front. 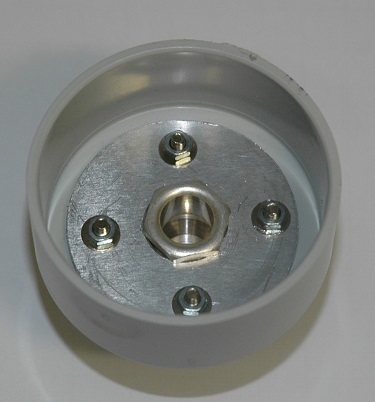 Details of the assembly of the board and male N type connector with the water pipe bottom end cap is shown below including the aluminium mounting disc for the N type connector attachment. Photo 2 The active antenna weather cover mounting plate with the N type connector attached. Top view. Photo 3 The active antenna weather cover with the N type connector attached. Bottom view. Photo 4 The active antenna circuit board attracted via sort length of coax to the N type connector within the protective weather cover bottom cap. Photo 5 The active antenna circuit board attracted via sort length of coax to the N type connector within the protective weather cover bottom cap. Bottom view. Photo 6 The active antenna completed assembly. 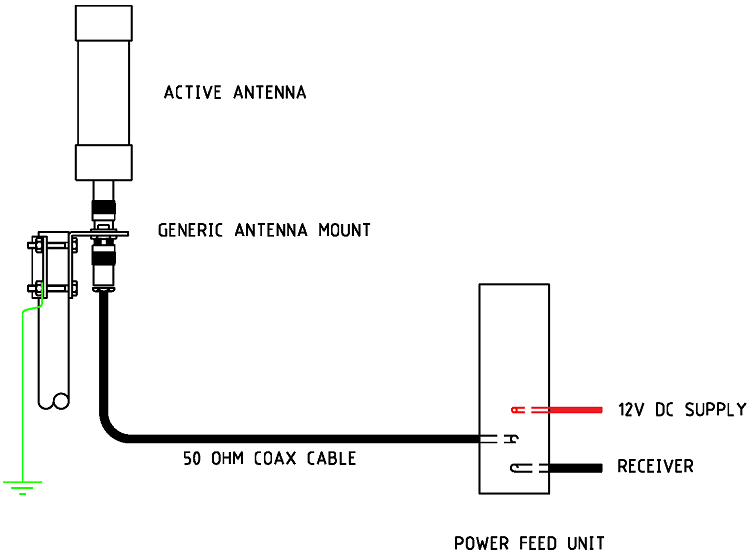 The original mini-whip article by Roelof Bakker, PA0RDT states that the active antenna should be installed on an insulated mast, however there is evidence that the active antenna in fact uses the outside of the coax shield as a ground path there by making the coax shield an integral part of the antenna. With the coax cable entering the radio room it is highly likely that the system will pick up all sorts of noise from equipment such as computers etcetera; therefore in this installation it is intended that the mast will be conductive and electrically connected to ground to encourage a cleaner system. Despite attempts at choking the coax cable with a balun, it yelled no detectable improvement as the antenna is of a very high impedance including the way that the coax shield acts as part of the antenna and there appears no way to isolate the coax shield from being part of the antenna by way of choking. Key installation hardware other than the active antenna are shown below with links to detail pages. Masthead Coax Power Feed Unit. Unit for injecting a 12V supply via the connecting coax cable for masthead equipment. Photo 7 The active antenna installed on stubby mast with out the R.F. choke at this stage. Photo 8 The active antenna installed generic antenna mount details. Photo 9 The masthead coaxial cable power feed unit install in the shack with the computer soundcard interface unit and the TS930 transceiver. While this is a bit of a rough comparison it is very encouraging. Antenna#1: 10m Band Sloper connected directly to the radio with no ATU. PA0RDT Active Antenna: Was located at the top of an iconic Australian metal cloths line. Active Antenna in this comparison has demonstrated consistently very good results when compared to the Antenna#1 results. While this appears to be good a results for the active antenna the setup of both antennas is less than optimal, however it is encouraging. 6NM 1214 S+35 S+40 Local BC, Northam 5km away. For powering the compact active wide-band receiving antenna via the coax cable. See Masthead coax power feed unit. Details of the generic antenna mount. See: Generic Antenna Mount.